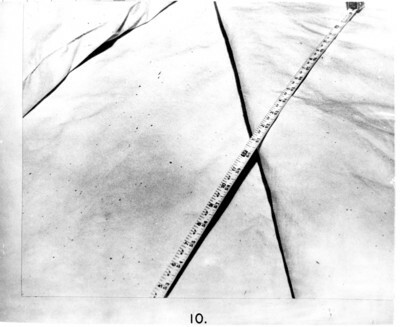 Utilizing the spots on the defendant's bed, it was noted that all those with elongated patterns had originated at a single center of origin that corresponded to exactly the region of Marilyn Sheppard's mattress on which the blood intensity was greatest and which was occupied by her head at the time she was found. It can therefore be stated with certainty that her head was in essentially the same position during all of the blows from which blood was spattered on her bed. This distribution is illustrated in photographs 7 through 11.